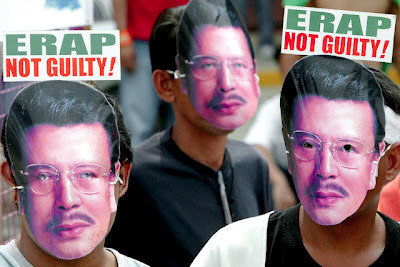 The Armed Forces of the Philippines (AFP) is apparently bracing for a repeat of Edsa III in the aftermath of a verdict on the plunder case against detained President Joseph “Erap” Estrada.Edsa III, an uprising led by thousands of Estrada’s mostly poor supporters in an attempt to restore him to Malacañang on May 1, 2001, was suppressed by former Vice President Gloria Arroyo, who, on Jan. 21 of that year, led a military-backed coup that toppled the now jailed leader and catapulted her to the presidency. American officials in Manila yesterday denied that the United States is building a military base in Mindanao, but admitted that it is constructing “temporary” structures across Mindanao worth at least $14.4 million for “medical, logistical and administrative services” to be used by US soldiers. Police have tightened security in malls in the eastern part of Metro Manila following reports that groups aligned with the Abu Sayyaf—the Jemaah Islamiyah and Rajah Solaiman Movement—could be planning “sympathy attacks” in public places in the metropolis. The Bureau of Immigration urged all overstaying aliens on Monday to come out and legalize their status as he assured them that they would not be arrested should they request for an extension of their stay in the country.